Boston Red Sox outfielder Mookie Betts was just named 2018 Most Valuable Player in the American League. He hit a major league-leading .346 with 32 homers, 80 RBIs and 30 stolen bases as the leadoff hitter for the World Champion Red Sox. The 2018 season was Mookie's 5th Major League Baseball season. Betts throws (the baseball) and hits right-handed. When [Red Sox teammate] J.D. Martinez first started bringing his big bag of toys into the clubhouse...his teammates didn't know what to make of it. At a glance, it appeared to be a gym bag full of Phys Ed equipment: a red heavy-duty dodgeball, Frisbees for disc golf, and almost everything else anyone would need for a family field day. It looked like he had raided a Play It Again Sports, but everything in the bag was a tool he used to refine his swing. The Frisbees caught Betts's eye. When he threw one, he realized how closely the motion resembled the one he used to swing a bat. 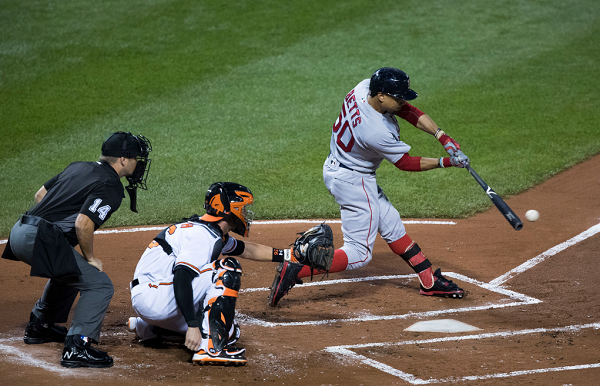 Betts: "You just throw it, and it kind of simulates the swing."